Vernor Vinge’s novel Rainbows End is fiction, but fiction with a bite. Vinge is a recently retired professor of mathematics and computer science, and he has an enviable track record at seeing things that aren’t quite clear yet and making them very real. This gift was first put on prominent display in “True Names,” a novella written in 1981 that predicted pretty much the entire network-connected world in which we live. Much of the computer jargon and network jargon of today is taken directly from this novella, composed on an Apple II while contemplating what kind of world a modem might portend. Rainbows End is a much more mature work, a full-blown near future novel, mostly set in San Diego, California. Like today, the San Diego of the near future is a biotech powerhouse, but it is a San Diego transformed by earthquakes and energy shortages. Houses are more energy efficient; traffic is efficiently controlled by computers, and people don’t so much recycle as take care of the environment by habit. Biotech advances have performed miracles. One such miracle is Robert Gu, a Pulitzer prize winning poet condemned to a dark dotage by Alzheimer’s disease. New drugs, new nanotechnology and new therapies have restored youth to his body and allowed him to recover his previous mental alertness, but without the extraordinary poetic gifts that made him famous. He is a young-looking historical footnote, attempting to fill in more than a decade lost to disease. He is assisted by his granddaughter, at once so familiar and very alien. Where Robert spent his school years in libraries devouring books, his daughter wears a computer and scans electronic libraries through special contacts. Public schools don’t worry with the old fashion fundamentals but instead focus on more practical skills: analysis, synthesis and integration. If you can carry around the entire world’s knowledge and stay constantly networked while walking around the playground, reading is an essential, writing is nice, but search skills are vital. Robert is none too happy with the network-integrated world, but soon finds that he is obsolete. If he is to survive, he needs to learn how to “wear:” wear and use a computer to stay constantly connected and to see not only the mundane world but the richly constructed, GPS-mapped overlays that seem to have taken over the world. He makes some poor choices and some poor friends – but you’ll have to read about that. The University of California, San Diego library – the building, not the institution – is a major, surprising character in the novel. As are Marines equipped not with assault rifles and knives but with combat-ready switches and routers. This is a post 9/11 world with terrorists, but the terrorists are network savvy, too, as are corporations of ill-defined loyalties and pan-national alliances that may or may not have a common goal. 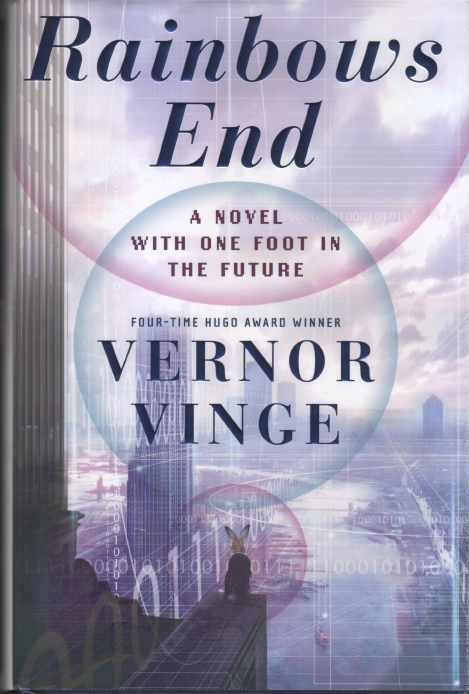 Vinge’s world is a complex world, an enticing world, and an uncomfortably familiar world.